Album Info: Places in Central Virginia I visited in 1983. 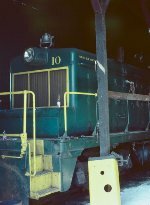 Title: Virginia Blue Ridge 10 hides in the engine house in Piney River. Title: A westbound hopper train on the old Virginian mainline at Altavista. Title: A westbound hopper train on the old Virginian mainline at Altavista picks up orders. Title: A westbound hopper train enters the yard at Crewe. Title: A Southern switcher works a warehouse adjacent to the Southerns yard in West Richmond. Title: The engine lineup at old RF&P Engine terminal. Title: A SBD southbound ready to leave Acca Yard. Title: One of the Lost Engines of Roanoke. Title: A westbound piggyback approaching the summit at Blue Ridge. Title: GP9s awaiting their fate in Roanoke South Yard. Title: A Chessie westbound passing through the yards at Lynchburg. Title: A Southern northbound arriving in Monroe.